WASHINGTON - Worried about increasing insurgent attacks in Afghanistan, the US military says it is sending extra air power there by shifting an aircraft carrier away from the Iraq war. 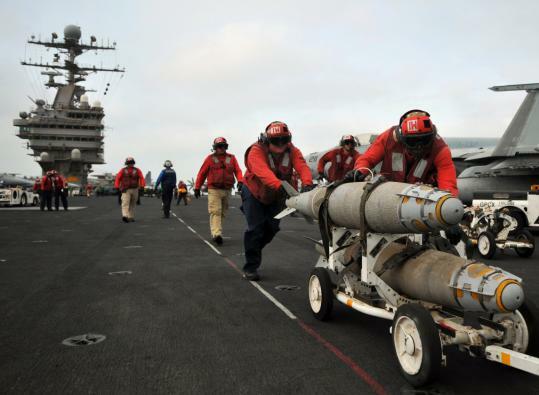 Defense officials said yesterday that the aircraft carrier USS Abraham Lincoln was moved out of the Persian Gulf and to the Gulf of Oman, shortening the time that the carrier's strike planes must fly to support combat in Afghanistan. One official said the decision reflects the worsened state of the fight in Afghanistan but improvements in Iraq as well. Since violence is down in Iraq, US defense leadership believes it is possible to focus some air capabilities away from Iraq and more on Afghanistan. The Navy routinely moves ships in and out of the Persian Gulf, where they support America's two ongoing wars and serve as a show of force to Iran and sign of support to regional allies. The departure of the aircraft carrier from the Persian Gulf still leaves a number of other ships there, including the amphibious assault ship USS Peleliu, other amphibious ships, and a couple of destroyers. There is still also "significant air power" remaining on the ground inside Iraq, one official said. Admiral Michael Mullen, chairman of the Joint Chiefs of Staff, said Monday that it appears "security conditions are holding" in Iraq and that important elements of a solution to the war - including reduced levels of sectarian violence, political reconciliation, and stronger Iraqi forces - are coming into view more than five years after the US invasion. Meanwhile in the seventh year of war in Afghanistan, Defense Secretary Robert Gates said last week that he has "real concern" about a sharp rise in attacks in the East, a development he blamed on Pakistan's failure to put pressure on insurgents there. Commanders in Afghanistan have long asked for more ground forces and more air support and Mullen has been frank that he would like to send more but that Iraq is the priority. After unsuccessfully pressing NATO for a year to send more troops, the Pentagon announced in January that it was ordering a Marine unit there instead to work in the volatile south. Though officials had promised they would stay for only six months, they decided last week to extend them by 30 days.